Labour leader Ed Miliband has called for the voting age at UK elections to be lowered to 16. He announced the plan in his party conference speech in Brighton. Giving the vote to 16 and 17-year-olds would make them "part of our democracy", Mr Miliband told activists. The Lib Dems promised the change in their 2010 manifesto and in Scotland, 16-year-olds will be able to vote in next year's independence referendum. The Labour leader also announced policies to freeze energy prices and build homes. Attacking the Conservatives, he repeated the phrase, "We're Britain - we're better than this," or a similar alternative almost 20 times. The comedian and prominent party supporter Eddie Izzard said: "I think fighting for women is great, the vote going down to 16 and 17-year-olds and fighting for people - the many not the few. I think that's the thing we always want to do." The move would affect more than 1.5 million teenagers in the UK. 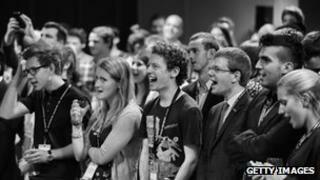 But the Conservatives accused the opposition leader of "student politics". "Earlier this year the unions demanded he politicise the classroom, with votes for youngsters who are still at school," said party chair Grant Shapps. "Today Ed Miliband has caved in."